Good health is not just about being disease and disorder free, it�s also about better understanding how your body functions so that you can take the steps necessary to keep it in good working order. When your body isn�t working properly, you feel more tired and less enthusiastic about life in general. This is your body�s way of telling you something is wrong and that it needs your help to fix it. Your body has amazing regenerative capacities, as long as you provide it the necessary tools for doing so. This section therefore looks at some of the things you can do to be proactive about remaining in optimum health at all times. The benefit to taking care of your body is having enough energy and enthusiasm to better enjoy all the wonderful things life has to offer. Ethyl alcohol (ethanol), more commonly known simply as alcohol, is legally consumed in most countries and plays a key social role in many cultures. In fact, according to Wikipedia, beer is the third most popular beverage in the world, after coffee & tea. Because alcohol is both socially acceptable and readily available, I think many people consider it relatively harmless unless consumed in large quantities on a regular basis. After all, if alcohol weren�t safe, the government wouldn�t allow it to be sold, right? Wrong! Prohibition didn�t work, so pragmatism eventually won and taxes on alcoholic beverages are now a substantial revenue source for government that would be tough to replace if alcohol were ever to become illegal once again. The truth of the matter is, alcohol is a psychoactive drug with very real short and long term health consequences. But because alcohol is legal in most countries and widely consumed at social functions, the decision whether to partake in or abstain from alcohol consumption is very personal and so must rest with each individual. This article has been compiled so you can make an informed decision on whether, how often and how much you choose to drink. When alcohol is consumed, it is absorbed into the bloodstream through the stomach and intestines. The liver immediately releases an ADH enzyme which begins the metabolic process that neutralizes and removes the alcohol from the body. The speed at which this happens depends in large part on how much of ADH enzyme an individual has in their liver and stomach lining (varies by individual and appears to be determined at least in part by genetics). Intoxication happens when a person takes in alcohol at a faster rate than it can be metabolized. Since alcohol is absorbed into the body more quickly than it is neutralized, one must be careful to control how much they drink if they don�t want to get drunk. On average, blood alcohol levels generally peak 30-45 minutes after consumption. You should also be aware that women absorb and metabolize alcohol differently from men. Alcohol blood concentrations tend to be higher, likely because they are smaller than men, and thus have a smaller amount of body water available to help dilute the alcohol. In addition, they tend to have lower levels of ADH enzymes in their stomachs, allowing a larger percentage of the alcohol consumed to be released into the blood. The generally accepted definition for heavy drinking appears to be 3 or more drinks per day for men, or 4 or more drinks per day for women. However, everyone tolerates and metabolizes alcohol differently, and so these numbers should be considered general guidelines only. It could be that your particular constitution doesn�t handle alcohol very well, so 2 drinks per day for you will lead to the same degree of health damage as 4 drinks per day for someone else. A recent study conducted at the Centre for Addiction and Mental Health (CAMH) in Canada claims that alcohol consumption is now the third leading cause of disease and injury worldwide (high blood pressure and smoking tobacco are first and second), and it has been found to cause over 200 different diseases and injuries. Here are some of the known health issues associated with alcohol consumption. While risk certainly increases at higher consumption levels, every person�s tolerance is different and thus how much is too much will vary from person to person. So be aware of the potential consequences and govern your alcohol consumption in accordance with your own personal comfort level for risk. Drug interactions � alcohol is central nervous system (i.e. brain and spinal cord) depressant and thus can intensify the effects of other depressants being taken at the same time. This can result in cognitive/memory impairment, euphoria, dissociation (emotional detachment from reality), muscle relaxation, lowered blood pressure or heart rate, difficulty breathing, and even death at high doses. Common depressants include barbiturates, benzodiazephines, opioids, phenothiazines, and antidepressants. Alcohol also increases the effects of cocaine, by combining with it to produce cocaethylene, a euphoric substance which lasts longer than cocaine by itself, and which some studies show as being harder on the heart. Alcohol can reduce the effectiveness of a number of medications, including some antibiotics, anti-coagulants and diabetes medications. It can also increase the effectiveness of others, producing some very negative side effects. A fairly detailed listing of known alcohol-medication interactions can be found on the National Institute of Alcohol Abuse and Alcoholism (NIAAA web) site. Liver damage � Alcohol is known to transform some over-the-counter pain relievers (for example, acetaminophen, found in Tylenol) into chemicals which cause liver damage, particularly in heavy drinkers. The damage is more likely to occur when acetaminophen is taken after the alcohol has been metabolized. Liver damage can be quite serious (i.e. to the point where a liver transplant is required), and it doesn�t take a lot of acetaminophen to cause this damage. People with existing impaired liver function should avoid this combination at all costs. Brain damage � Computed tomography (CT) and magnetic resonance imaging (MRI) have shown researchers that heavy drinking causes physical damage to the brain, most extensively in the cortex of the frontal lobe, which is believed to be the area of the brain responsible for higher intellectual functions. Brain shrinkage has also been observed in the deeper brain regions associated with memory, as well as in the cerebellum, which helps regulate coordination and balance. Studies also show that females, even young women, face more brain damage than men who drink the same amount for the same period of time. Heart issues � Researchers at the University of Bristol in London, England, report that moderate drinking may increase blood pressure more than previously thought. Hypertension, or high blood pressure, can lead to stroke, heart failure, heart attack and kidney failure. Atrial fibrillation has been called the �Holiday Heart Syndrome" because it can occur around the holidays when people who do not usually drink may overindulge. The condition is not life-threatening, but if left untreated, it can produce palpitations, chest pain, fainting, congestive heart failure, or stroke. People with atrial fibrillation have up to seven times greater risk of having a stroke. Those at risk for stroke should take note of a study published in Stroke: Journal of the American Heart Association by researchers at the Harvard Medical School. The study found that the risk of stroke after alcohol consumption was 2.3 times higher in the first hour after taking a drink compared to the risk of stroke when no alcohol was being used. The risk of having a stroke in the second hour after drinking remained 1.6 times higher. Cancer � Alcohol consumption has been shown to increase the risk of certain types of cancer, including breast and liver cancer. The US Department of Health & Human Services now lists alcoholic beverages as a �known� human carcinogen, whereas previously alcohol was considered a �potential� hazard. Their Report on Carcinogens (9th edition) notes a direct causal relationship between alcoholic beverages and cancers of the mouth pharynx, larynx and esophagus, with risk highest among smokers and at higher levels of consumption. A study by the Journal of the American Medical Association found a direct relationship between the amount of alcohol regularly consumed and risk of breast cancer. Women who drink 2-5 drinks per day were 41% more likely to develop breast cancer than nondrinkers. The health risks were ever greater for older women. In contrast, drinking moderately or not at all can reduce the chance of getting breast cancer. The American Cancer Society�s Cancer Prevention Study II data indicates there is a definitive link between heavy alcohol consumption and an increased risk of developing pancreatic cancer. Diabetic complications � Diabetics who drink are at increased risk for blood sugar fluctuations. Blood sugar may increase or decrease, depending on circumstances. Drinking moderate amounts of beer or another high carb beverage on an empty stomach could cause blood sugar to increase. Alcohol increases hunger, causing overeating and further increased blood sugar levels. Alcohol can also block the effects of insulin or oral medications used to treat diabetes. The net result is dangerously high blood sugar levels, which contribute to complications such as vision, kidney and heart problems, osteoporosis and nerve damage. However, higher levels of alcohol consumption can have the opposite effect, particularly if someone is taking insulin or oral diabetes medication. That�s because after alcohol is consumed, the liver gives breaking down alcohol priority over converting stored carbohydrates into glucose, even if blood sugar levels are dropping. So if your blood sugar is low, drinking alcohol could cause it to drop further to more dangerous levels. Normal signs of hypoglycemia might be mistaken for intoxication, putting one at increased risk for seizure or coma. In type 1 diabetes, moderate consumption of alcohol in the evening may predispose patients to hypoglycemia after breakfast the next morning. Gastro-intestinal issues � According to researchers Christiane Bode, PH.D., and J. Christian Bode, M.D., alcohol can have a negative effect on the gastro-intestinal tract. Impaired function of the muscles separating the esophagus from the stomach can make a person more susceptible to heartburn. Damage to the mucosal lining of the esophagus can increase the risk of esophageal cancer. In addition, alcohol can interfere with gastric acid secretion and muscle activity in the stomach, small and large intestines, as well as inhibit the absorption of nutrients. This can lead to polyps and possibly colorectal cancer. Excess alcohol consumption can lead to pancreatitus, which in turn can affect insulin production, leading to hypoglycemia or even diabetes. Alcohol induced diabetes can be fatal. Lowered immunity � Over time, alcohol consumption can weaken one's immune system so that they are more susceptible to infections. Bone disease � Alcohol can inhibit the production of osteoblasts, cells responsible for bone formation, which could lead to osteoporosis and increased risk of bone fracture. Circadian disturbances � Animal studies show that alcohol consumption interferes with the body�s internal time clock (circadian function) and can cause sleep disturbances, depression, compromised immune function, and increased risk for certain types of cancers. Appearance � Alcohol can wreak havoc on your appearance. Because alcohol is a diuretic, it causes dehydration which can lead to dull, dry skin and hair and premature wrinkles. Excessive alcohol consumption can also damage blood vessels, leaving permanent patches of redness on your skin, especially around the nose and cheeks. Alcohol can aggravate pre-existing skin conditions such as rosacea, eczema, or psoriasis. Reproductive issues � Heavier drinking can lead to menstrual disorders and fertility problems, as well as miscarriage, birth defects or fetal alcohol syndrome in pregnant women. Overdose � Extreme intoxication can kill. An intoxicated person can pass out, vomit while unconscious and choke to death. Even if they don't choke, alcohol poisoning can be fatal. Signs include clammy skin, low body temperature, slow and laboured breathing and incontinence. If acute alcohol poisoning is suspect, seek immediate emergency medical care. While all of the above is pretty sobering stuff, it's not my intention to convince you not to drink, or to condemn you should you choose to do so. Nor am I trying to suggest that having a few drinks with friends every now and then will lead to any or all of the above maladies. The point I want to make is that just because alcohol is legal doesn�t mean that it�s safe for everyday consumption. Moderation is the key. If, like me, you ask yourself from time to time what�s wrong with your ability to concentrate, you may find this article an interesting read. However, please be conscious of the dangers of self-diagnosis. People often forget things when they�ve got a lot on their plate, but that doesn�t mean they have a serious memory problem or brain fog issue. But on the flip side, you should also be aware that our minds and bodies are intimately connected, and a problem with the physical body can lead to cognitive impairment. Brain fog refers to a decreased level of clarity which can impair a person�s ability to think logically and/or make them abnormally forgetful. Someone with brain fog may feel confused, unable to focus on a specific thought or task, and perhaps a little detached from reality. Other definitions include feeling spacey or lost. People experiencing brain fog may be unable to concentrate on tasks long enough to complete them. According to Brain Harmony Center, almost everyone experiences brain fog from time to time, and brain fog is a cognitive condition most people can identify with. (I know I can.) Brain Harmony Center believes a large number of people live with a constant foggy feeling and think that�s normal, even though it�s not. In fact, most of the sources I reviewed believe brain fog is a common problem which can affect anyone at any age, even though it is not commonly acknowledged within the medical community as a specific condition. Many people believe it should be recognized as a medical disorder, claiming that people can suffer from it without realizing it, and go through their entire lives thinking they�re stupid when that�s really not the case. During my research I discovered that brain fog can be caused by a host of physical, emotional and biochemical factors. Much of what I read made total sense. For example, lack of sleep does make it difficult for me to function at peak efficiency, and when I have a headache or I�m super stressed I find it hard to concentrate on a specific issue for any length of time. The type of brain fog in these personal examples is a temporary impairment, more the consequence of a specific action or event than a medical disorder. Once I get caught up on my rest, the headache subsides or the stress abates, I�m back to thinking clearly once again. But not that long ago I found myself in a situation where my brain fog didn�t go away after a good night�s sleep, even after several weeks of ensuring I was getting adequate rest. This was no temporary impairment, but rather a chronic long term side effect of a more serious physical problem � a systemic yeast infection. This frustrating experience opened my eyes to how much our brains rely on our physical bodies to provide the fuel and various other nutrients required to function at peak efficiency. So when the physical body is unwell, brain health and function will also be compromised, at least to some degree. Following are a number of physical issues that could potentially lead to brain fog. Resolving any that may apply to you will help ensure your cognitive powers are functioning efficiently so that you can think and focus as logically and clearly as possible, and keep those annoying episodes of brain fog we�ve all experienced to a minimum. Fatigue � Fatigue impairs energy production, limiting the amount of fuel available to the brain, which requires up to 30% of our energy production to operate efficiently. Because the brain can�t store fuel, any drop in energy production will quickly lead to cognitive impairment and a corresponding feeling of fogginess. Illness � Illness can impair metabolism, affecting energy and oxygen flow to the brain. In addition to metabolism impairment, infections also release toxins into the bloodstream, which are then transported to the brain where they disrupt brain function. Brain fog is also a reported symptom of a number of medical disorders, including Fibromyalgia and Chronic Fatigue Syndrome. Poor oxygenation � A lack of oxygen leads to brain hypoxia, which can create temporary memory loss, difficulty in paying attention and difficulty in making sound decisions. (In more severe cases, brain hypoxia can lead to seizures, coma and brain death.) Some issues that limit oxygen flow to the brain include asthma, bronchitis, COPD, clogged arteries and shallow breathing. Note that chronic carbon monoxide poisoning can limit oxygen uptake within the body. Insufficient hydration � Water plays a key role in transporting all required nutrients to the brain. Coffee, tea and many flavoured drinks can be dehydrating, so your best bet is to replace them with plain water. It can apparently take several weeks of drinking a sufficient quantity of water to achieve good hydration at the cellular level, so if you experiment with cutting coffee or tea from your idea, be sure to allow enough time to evaluate the full effect. Nutritional deficiencies � The brain requires many different nutrients to function properly, including calcium, magnesium, zinc, copper, L-glutamine (an amino acid found in beef, chicken, fish, eggs, milk, dairy products, wheat, cabbage, beets, beans, spinach, and parsley), L-taurine (an organic acid widely distributed in animal tissues), choline, thiamine (Vitamin B1 ), B6, B12 and other B vitamins. Electrolyte imbalances (i.e. after heavy exercise or other physical exertion) can also create problems within the brain. Metal toxicities � Progressive accumulation of toxic metals (lead, mercury, cadmium, arsenic, aluminium, nickel, beryllium, copper) and trace elements (iron, manganese, chromium) can affect brain function. Endocrine issues � Endocrine glands produce the hormones required to regulate body function. The endocrine system and the brain are very closely linked, and problems with the endocrine system can affect energy levels, mood, blood sugar levels, body temperature, sleep, sexual function, digestion, appetite, weight and more. Physical issues � This may include structural misalignments which create nerve impingement, concussion, brain tumours, epilepsy, meningitis, encephalitis, and so on. Medications � Side effects from certain medications can impact brain function, and combining multiple drugs can produce unforeseen side effects. Common medications which can create problems include those for allergies, pain, high blood pressure, heart arrhythmias, glaucoma, infections, depression, anxiety, inflammation and cancer. �Chemo brain� is the term commonly used by cancer survivors to describe thinking and memory problems that can occur after cancer treatment. Reported problems include being unusually disorganized and taking longer to do routine tasks, confusion and difficulty concentrating, finding the right word or learning new skills, short term memory problems and short attention span. The American Cancer Society reports these effects are usually (but not always) temporary. You should be aware that a new study by the University of Rochester Medical Center indicates that tamoxifen, a drug which has been commonly prescribed to treat breast cancer for the past 30 years and is sometimes used as a preventive measure in high-risk individuals, kills myelin-producing brain cells in significant numbers. (Myelin helps to protect nerve cells and facilitates the transmission of electrical impulses between cells. Damaged myelin can lead to both physical and mental impairment, and plays a key role in degenerative diseases like multiple sclerosis.) Fortunately, the study also identified a compound called AZD6244 that helps protect myelin in mice who were injected with both AZD6244 and tamoxifen, and researchers are now looking at what the correct dosage might be to achieve that same protective measure for humans. In addition to the above physical concerns, anything that causes someone to feel stressed for any length of time can also lead to brain fog. The brain can only handle so much, and information overload can lead to a partial shutdown as a self-protective mechanism. Individuals who undergo traumatic experiences often report feeling as though they were in a dreamlike state at the time, with events unfolding around them in a surreal manner. Whether your brain fog is temporary or long term, the best way to resolve it is to treat the underlying physical cause. Regardless of cause, adequate rest, exercise and nutrition is always a good place to start. It wasn�t that long ago when medical authorities believed that diminishing brain capacity was part and parcel of the natural aging process. However, researchers are now discovering that a decline in memory and mental functioning is not necessarily an automatic consequence of aging. In fact, our brains continue to develop as we age, right into our senior years. According to Barbara Strauch (author of The Secret Life of the Grown-Up Brain: The Surprising Talents of the Middle-Aged Mind and currently Health Editor of The New York Times), middle aged brains are superior to younger brains when it comes to inductive reasoning and problem solving. They are therefore better at sizing up a situation and reaching a creative solution. Older brains may no longer learn as fast as they once did, but Kathleen Taylor, a professor at St. Mary�s College of California, tells us the brain continues to change, not in size, but in allowing for greater complexity and deeper understanding. A healthy older brain continues to build neural pathways that allow an older person to recognize patterns and thus see significance and find solutions much faster than younger people. All this is a great news, particularly when you consider that the expected lifespan of human beings continues to increase. According to the Immortality Institute, two thousand years ago humans lived less than 20 years. By 1796, the average lifespan had risen to 24 years, and then doubled to 48 a hundred years later. Today, humans live an average of 63 years (world average), and much higher in first world countries � 80 years in Japan, 77 years in the US. 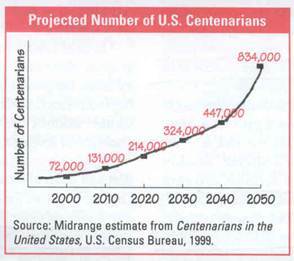 The US Census Bureau is predicting a huge increase in the number of individuals living to 100 years of age or more, as per the following graph. Dr. Ronald Klatz, founder and President of the American Academy of Anti-Aging Medicine, believes both baby boomers and the generation following could live up to 150 years. If these projections are true, then it is now even more important to take care of our brain so that our brain can continue to take care of us as we mature to a ripe old age. The older we get, the greater the odds of developing neurodegenerative diseases such as Alzheimer�s or Parkinson�s. Current research indicates these diseases are a result of cumulative damage over time, so the more we do now to protect and support brain health, the longer we can delay onset of these diseases. Neurodegenerative diseases aside, holding onto our memories and our cognitive abilities for as long as possible will allow us to live more independently and interact more fully with the rest of the world for a longer period of time. We can therefore continue to live life on our own terms, to the fullest extent possible. Nutrition � While glucose (sugar) is the main fuel source for your brain, your brain also requires protein and unsaturated fat along with adequate vitamins and minerals to keep it in a peak state of health. Physical exercise � According to the research, physical activity increases the circulation of blood to the brain. Improved circulation provides greater nutrients and oxygen that keep existing brain cells healthy, and may also promote the development of new cells. In addition, regular exercises reduces the risk of heart disease, stroke and diabetes, all of which damage brain cells by reducing blood circulation to the brain. Mental exercise � Use it or lose it, particularly after age 40. According to the Brain Foundation (Australia), you can wake up unused areas of your brain by giving it new challenges. You will also create new neural pathways which can be recruited when neurons from existing pathways begin to die off as you age. Adequate rest � The brain requires sufficient amounts of "deep" sleep in order to adequately repair brain cells damaged by attacks from foreign bodies such as environmental pollutants and free radicals. It also requires enough REM (rapid eye movement) sleep to organize the day�s activities and events into proper memories. It is well documented that sleep deprivation can significantly impair cognitive function, as well as memory and mood. Stress reduction � Research indicates that stress has the potential to damage brain cells. Long term stress can create harmful chemical imbalances inside the brain, as well as impair blood flow to it. Dr. Robert Sapolsky, a Stanford neurobiologist, has found that the major stress hormone cortisol damages brain cells in the hippocampus, one of brain�s key memory centres. Environmental factors - Smoking been shown to promote mental decline as one ages. In addition, hidden environmental toxins such as pesticides, herbicides and dioxins found in our food and water can put you at risk for premature brain aging and dementia. Physical trauma � A head injury can cause all sorts of unseen damage which may not manifest immediate symptoms. For example, there is growing evidence that people who experience brain injuries are at greater risk of developing Alzheimer�s down the road. Any significant blow to the head should therefore be evaluated by a medical professional to determine the extent of the damage. Part Two of this article series will examine the nutritional requirements of the brain and outline some steps you can take to ensure your brain gets the proper nutrition it needs to remain in healthy working condition as you age. Next, Part Three will look at how the brain works and provide some mental exercises for stimulating your brain cells. Finally, Part Four will address the importance of proper rest and stress management, and also review some key environmental factors that can damage the brain and lead to cognitive decline. In addition, for a detailed overview of how the brain works, visit McGill University�s detailed overview of The Brain From Top to Bottom. A more technical overview can be read at the National Academies Press web site where there is an open book entitled Discovering the Brain published by the National Academy of Sciences. A few sources also suggested augmenting one�s dietary intake with vitamin, mineral and other food supplements, because due in large part to soil depletion our foods no longer contain as many vitamins and minerals as they once did. However, food supplements in Canada are not regulated to the same extent as other food items, so there are no guarantees you will be getting the exact dosage as outlined on the label. Keep in mind that just become something is good for you, more of it is not necessarily better. In fact, many vitamins and minerals are toxic in larger quantities, as I�ve indicated below. Therefore, before choosing to supplement, review your list of planned supplements with your health care professional to help ensure you don�t accidentally overdose. Fruits and vegetables contain an abundant supply of vitamins, minerals, phytochemicals and antioxidants that will protect both your brain and your body from damage, disease and premature aging. The following list of vitamins and minerals have beneficial effects for the entire body, but due to time and space considerations only those benefits directly affecting brain health are included below. Vitamin B3 (Niacin) � Important for normal brain function and is possibly a memory enhancer. According to InteliHealth, severe niacin deficiency can lead to dementia. One large study found that dietary niacin may protect against Alzheimer�s disease and age-related cognitive decline, but further research is needed to confirm these results. Vitamin B9 (Folic acid or folate) � Vitamin B9 assists in regulating mood and sleep patterns, particularly in older people. According to Wikipedia, there is some evidence to link folate deficiency with both schizophrenia and depression. Folic acid may act as an antidepressant through its effects on noradrenaline and serotonin receptors within the brain. How Stuff Works states that folic acid deficiencies have been linked to dementia in the elderly, and to lower scores on memory tests for younger individuals. Food sources include liver, legumes (beans, peas, lentils), fortified grain products (pasta, cereal, bread), leafy vegetables (spinach, asparagus, turnip greens), sunflower seeds and baker�s yeast. The following fruits contain moderate amounts of folic acid: oranges, pineapples, cantaloupes, honeydew melons, grapefruits, bananas, raspberries and strawberries. Beets, corn, tomato juice, vegetable juice, broccoli, brussels sprouts, romaine lettuce and bok choy also contain moderate amounts of folic acid. Vitamin B12 (Cobalamin) � Important for memory and other cognitive functions, thus playing a key role in the brain and nervous system. Vitamin B12 deficiency can lead to fatigue, depression and poor memory, and even mania or psychosis. B12 deficiency can also weaken the myelin sheath that protects the neurons in our brain and nervous system, which damages nerve pathways. Depending on which nerves are affected (motor, sensory, or autonomic) and where they are located, symptoms can include muscle weakness, cramps and spasms, loss of balance and coordination, tingling, numbness or pain, extreme sensitivity to touch, abnormal blood pressure and heart rate, constipation, incontinence and sexual dysfunction. Note that the ability to absorb enough B12 can decline with age and so people over 60 may be wise to start monitoring their B12 levels as part of their annual physical. Vegetarians, endurance athletes and heavy drinkers are also at risk. Low blood levels may require supplements or monthly injections. Choline (Generally grouped with the B-Complex Vitamins, though not officially considered one of them) � Adequate choline is important for the structural integrity of our brain (and other) cells, as well as the synthesis of acetylcholine. According to How Stuff Works, a deficiency in rats has been found to permanently affect the learning and memory centres of their offspring, though the same has not yet been proven for humans. Choline deficiency may also be linked to neurological disorders in children or adults. Vitamins C & E � As antioxidants, Vitamins C & E protect brain cells against free radical damage which occurs during the normal aging process and also in neurodegenerative diseases like Alzheimer�s. Due to their protective effect, these vitamins could also play a role in improving memory. Phytochemicals (Chemicals inside plants which have protective or disease preventative properties) � There are over a thousand different phytochemicals in the various fruits and vegetables we ingest, which function as antioxidants, hormonal supporters, enzyme stimulators, DNA protectors and/or antibacterial agents. Their antioxidant properties help protect brain and nervous system cells against free radical damage. For example, the phytochemical reservatrol appears to protect the brain and spinal cord from oxidative damaged caused by diabetes. The National Onion Association has produced a paper which states that the flavonoid quercetin is associated with a decreased risk for brain cancer in humans. According to Tuberose.com, Acetyl-L-carnitin improves energy production in brain cells and protects them from free radical damage. Magnesium � Vital for the production and transfer of nerve impulses, magnesium may therefore be important in learning and memory. HowStuffWorks.com states that deficiencies may be linked to Alzheimer�s. According to Wikipedia, it is also speculated that magnesium deficiency can lead to depression. While glucose (sugar) is the main fuel source for your brain, your brain also requires unsaturated fat to keep it in a peak state of health. The best types of fats for the brain are monounsaturated fats and polyunsaturated fats. Many internet sites are claiming that olive oil, a monounsaturated fat, will improve short term memory and/or prevent age related memory loss in healthy older people. However, none of these sites reference any specific research studies to back up this claim. Because monounsaturated fat lowers LDL (bad) cholesterol and may possibly increase HDL (good) cholesterol (more studies are needed to confirm monounsaturated fat�s ability to increase HDL), it helps protect the heart and blood vessels � thus ensuring a steady supply of oxygen and nutrients to the brain. This could be part of what contributes to improved memory. Polyunsaturated fats are high in omega-3 fatty acids, which, according to Wikipedia, help the brain to repair damage by promoting neuron growth and strengthening the myelin sheath which protects neurons. This has implications in many areas of brain function, including memory, learning and neurological disorders. A study published in the April 2007 issue of the Journal of Neuroscience found that mice which were genetically modified to have excess amyloid and tau proteins in the brain (similar to people with poor memory) had reduced levels of these proteins after three months of DHA (a type of omega-3 fatty acid found primarily in fish oil) supplementation. Another study published in the April 2007 edition of the Journal of the Developmental and Behavioral Pediatrics found that parental ratings of children with learning and behavioral problems improved significantly after 30 weeks of supplementation with polyunsaturated fatty acids (both omega-3 and omega-6). An April 2008 study found that omega-3 fatty acids protected mice from damage to their brain�s dopamine system after they were exposed to a neurotoxin commonly used to simulate Parkinson�s disease (Parkinson�s is a degenerative disorder caused by loss of dopamine). There are three types of omega-3 fatty acids important to human nutrition. DHA and EPA appear to exhibit more cardiovascular benefits than a-linolenic acid, which needs to be converted to DHA by the body. DHA and EPA are made by microalgae consumed by fish, who accumulate it in high concentrations in their internal organs. Sources of DHA and EPA therefore include oily fish and fish oils. A-linolenic acid is found in vegetable oils, particularly seed oils such as canola, walnut, soy and flax. The various neurotransmitters in our brain are constructed from amino acids, which are essentially proteins. In addition, there is evidence to indicate that the concentration of certain amino acids can affect cognitive performance and mood state, and that the brain may require specific amino acids during periods of under-nutrition or when individuals are exposed to highly stressful conditions. The human body requires 22 different amino acids to sustain life, and the human body is able to manufacture all but 8 of them. The 8 our bodies can�t manufacture (phenylalanine, valine, threonine, tryptophan, isoleucine, methionine, leucine, and lysine) are considered "essential" amino acids in that they must be obtained from food sources. All organic matter is made of up various proteins. �Complete� proteins, such as meat, poultry, eggs, fish, milk, and cheese, contain all the essential amino acids. �Incomplete� proteins, on the other hand, each contain some, but not all, of the essential amino acids. However, incomplete proteins can be combined so that together they provide all 8 essential amino acids. This makes it possible for strict vegans to obtain all the essential amino acids without consuming animal products. When it comes to protein, many people automatically think animal sources such as beef, chicken, pork or dairy products are best. However, these foods contain high amounts of saturated fats, which increase blood cholesterol levels and risk of cardiovascular disease. Unsaturated fats � the monounsaturated and polyunsaturated fats described above � can actually decrease cholesterol levels and corresponding risk of heart disease. While you need not avoid meat or dairy products completely, you might consider fish and other unsaturated fat options when available. Carbohydrates are divided into two groups. Simple carbohydrates, or sugars, include fructose (fruit sugar), sucrose (table sugar) and lactose (milk sugar) as well as several others. Complex carbohydrates (fibres and starches) include vegetables, whole grains, peas and beans. Dietary fibre is found primarily in the complex carbohydrates. The digestive system breaks down both types of carbohydrates through a complex chemical process and converts them to glucose, the body�s primary energy source. Glucose is the sole fuel source for your brain. (In order to use proteins and fats as brain fuel, your body must first convert them to glucose.) Thus the amount of glucose available to the brain at any point in time will affect brain performance in terms of mood, memory, cognitive reasoning, muscular coordination, and so on. Glucose is released into the bloodstream during the digestive process. Between meals it comes from glycogen stores in the liver, or from the conversion of fat stores to glycerol and fatty acids, which in turn are converted to glucose. From the bloodstream glucose is then transported to the brain. The body carefully monitors blood glucose levels, because too little blood glucose can lead to hypoglycemia and too much blood glucose results in hyperglycemia. However, as we age our ability to adequately control blood glucose levels declines, which can lead to diabetes. Diabetics have four times the risk of getting dementia. For additional background information about diabetes, click here. Information for this article was obtained in part from: Wikipedia, Discovery Health, Intelihealth, Phytochemicals.info, National Academies Press. Next week�s instalment will examine how the brain works and provide some mental exercises for stimulating your brain cells. Until recently, the prevailing view of the human brain was that once it had developed to maturity, it stayed more or less static until cells began to die as a result of aging or injury. As brain cells died, a corresponding portion of the brain's processing ability was lost forever. However, evidence is quickly accumulating to support the idea that the human brain is constantly growing and changing with every single thought and experience. The more the brain is used, the more its processing power increases as it develops additional neural pathways. This means that as you learn new things, you further enhance your processing ability as well as your learning capacity. The name given to this concept is neuroplasticity, which refers to the brain�s ability to reorganize itself by forming new neural connections. Neuroplasticity is what allows the brain to continuously absorb information and learn new skills, as well as improve its inductive reasoning and problem solving capabilities. Neuroplasticity also allows the brain to alter its structure so that other parts of the brain can take over functions lost through disease, injury or aging. This learning plasticity appears to exist from cradle to grave. Dr. Michael Merzenich, scientist, educator and founder of Scientific Learning Corporation and Posit Science Corporation (companies which develop therapeutic programs for the neurologically and psychiatrically impaired), has developed programs that work for people of all ages, from children with learning disabilities to senior citizens who wish to improve their cognitive and memory skills. He has found that the brains of seniors who use his brain fitness program learn to function as if they were 10-25 years younger. Dr. Norman Doidge, a psychiatrist, psychoanalyst, researcher and author from Toronto, Canada, has written a book about neuroplasticity and the amazing resilience of the human brain. The Brain that Changes Itself documents case histories of individuals who have made remarkable progress despite their conditions being dismissed as "hopeless" by the medical community. Cases include a woman labeled retarded who cured her deficits with brain exercises, a blind man learning to see, stroke patients recovering their faculties and learning disorders cured. Highlights of these case histories were featured on an episode of David Suzuki�s The Nature of Things and can be viewed online at the CBC (Canadian Broadcasting Corporation) website. If you have 45 minutes, it�s a fascinating episode. But it�s not just the severely disabled who can benefit from brain exercises. Anyone, regardless of age or life circumstance, can improve brain function and memory by challenging their brain to think and perform differently. Many researchers believe that doing so will build a "cognitive reserve" that is more adaptable and flexible in some areas to compensate for declines in others. The cognitive reserve will thus help keep our brains functioning more efficiently for a longer period of time. While loss of brain function is inevitable at some point, we can all take steps to delay cognitive decline much longer than one might think. The Brain Foundation (Australia) has developed an educational web site that discusses the importance of exercising and challenging your brain and provides some suggestions regarding how to do so. The site cautions that unused parts of the brain stop working, while challenging your brain wakes up new areas and creates new pathways which appear to become alternative routes when brain neurons die off in middle or old age. Build a cognitive reserve � The research shows a more active brain is less at risk for dementia, including Alzheimer�s disease. Do difficult things � To enhance brain plasticity, take up new projects and hobbies to challenge your intellectual skills, perhaps by taking courses at the local community college or enrolling in some free online courses. Change things up � Change your usual routine by driving to work via as many different routes as you can, alter your morning routine on a regular basis, and/or try doing things with your left hand if you�re right handed, or vice versa. Beat the clock � Timed activities, even those as simple as putting away the groceries or folding laundry, force you to pay attention, work quickly and flexibly, and look at information in different ways. Use it or lose it � The key is to keep your brain stimulated, because unused parts of the brain will eventually stop functioning properly. Jeffrey Rossman, PhD and Director of Life Management at Canyon Ranch in Lenox, MA, suggests one of the most powerful ways we can enhance and maintain healthy brain function is through education. He claims that more education appears to have a protective effect, even for those who have Alzheimer�s. According to a study published in Archives of Neurology, Dr. Catherine M. Bro, PhD and her colleagues at Washington University reported that in a study of 200 seniors over a five year period, many individuals with high levels of formal education exhibited no signs of dementia associated with Alzheimer�s disease, despite the fact brain scans revealed they had significant deposits of beta-amyloid, a toxic protein which accumulates in the brains of those with Alzheimer�s. The researchers hypothesized that formal education allowed these individuals to build up a cognitive reserve which allowed their brain to compensate for areas damaged by the disease. Dr. Rossman therefore recommends we keep learning as we age. Learning new information is helpful, but learning new skills is even better. He also suggests we maintain and improve brain processing speed and reaction time with brain-training software. Since social contact is particularly important for healthy aging, games played in social settings are important. He recommends activities like ballroom dancing, tennis and table tennis, because they combine aerobic challenge, social interaction, mind-body coordination and fast decision making. The message from the experts is clear: we have a lot more control than previously thought over how well our brain continues to function into our senior years. So if we want to protect ourselves from the debilitating effects of neurodegenerative diseases such as Alzheimer�s and retain our full faculties for as long as possible, it�s critical that we maximize brain plasticity by adding to our repertoire of knowledge and skills on a regular, ongoing basis. Information for this article was obtained in part from: Norman Doige.com, CBC Documentaries, Brain Foundation, HealthyBrain.com, Alzheimer�s Society of Canada, Rodale.com, National Academies Press. Next week, the fourth and final instalment in this article series will address the importance of proper rest and stress management, and also review some key environmental factors that can damage the brain and lead to cognitive decline. So far in this Maximize Your Brain Power series, I�ve identified seven key factors (nutrition, physical exercise, mental stimulation, adequate rest, stress reduction, environmental toxins and physical trauma) which are critical to maximizing brain power over the course of your lifetime. I�ve also provided a more detailed overview of the brain�s nutritional requirements and the importance of ongoing mental stimulation through continuous learning for maintaining and enhancing brain plasticity into your senior years. Now Part Four will address the importance of proper rest and stress management, and also review some key environmental factors that can damage the brain and lead to cognitive decline. The number of hours Americans are sleeping has dropped significantly since 2001, yet research shows that both quantity and quality of sleep are crucial to ensuring your brain continues to operate at maximum capacity. Lack of sleep affects our brain on a number of levels, including mood, memory, learning and cognitive function. It also plays a role in many mental disorders. An earlier 2002 National Sleep Foundation poll reported that Americans who got less than 6 hours of sleep on weekdays were more likely to be tired, sad, stressed and/or angry, while those who slept longer than 6 hours were more likely to be optimistic and/or satisfied with life. It doesn�t take much sleep loss to affect our mood. According to Mark Mahowald, a professor of neurology at the University of Minnesota Medical School, "Just about any degree of sleep deprivation will result in irritability and has far-reaching ramifications in the workplace, family, classroom, and behind the wheel". According to Wikipedia, we�ve been formally studying the effect of sleep on memory retention since 1924, when it was established that memory retention was better after a period of sleep. While we still don�t fully understand all the mechanisms, we do know that adequate sleep helps memory on two fronts. First, when we are well rested we can better concentrate and focus our attention on something so that it is more precisely encoded into our brain. Second, the sleep process itself appears to more permanently consolidate our memories through strengthening the neural connections associated with them. Our ability to concentrate also impacts our capacity to learn new things. According to the Division of Sleep Medicine at Harvard Medical School and WGBH Educational Foundation, sleep deprivation causes focus, attention and vigilance to drift so that it is much harder to absorb incoming information. In addition, our tired brain can no longer coordinate information properly so that we lose our ability to access previously learned information. According to an article published on WebMD, prolonged sleep deprivation such as that caused by sleeping too few hours each night on an ongoing basis can seriously affect cognitive function, particularly on routine, repetitive tasks, or those which require close attention for long periods, as shown through studies on sleep-deprived doctors. Major disasters such as Three Mile Island, Chernobyl and the Exxon Valdez oil spill have been linked in part with human error due to lack of sleep. According to the experts, many people are too tired to realize how sleep-deprived they are or to recognize their slower reaction time and thinking impairments. The Franklin Institute has reported sleep issues play a key role in many mental disorders such as depression, schizophrenia, Alzheimer�s disease, stroke and head injury. The amount of sleep a person gets has a major effect on symptoms experienced for any of the above. As you can clearly see, getting adequate levels of sleep is critically important to maximizing your brain power at all ages and stages in life. Exactly how much sleep is required each night varies for each individual, depending on their own unique combination of genetics and lifestyle. However, it�s been said that if you fall asleep the moment your head hits the pillow and/or you need an alarm clock to wake up, you�re probably sleep deprived. Use this as a guideline when determining whether you�re getting enough sleep to function at your peak capacity. As soon as your brain perceives any sort of �stressor� (real or imagined threat), it orders the adrenal glands above your kidneys to release adrenaline. The adrenaline in turn causes a chain reaction in your body, including increases in blood sugar, heart rate and blood pressure, which energize your body in preparation for dealing with the situation. Your brain also gives the signal for your adrenal cortex to produce cortisol. Cortisol works to keep your blood sugar and blood pressure up so that your energized state can be maintained. Cortisol has been shown to damage and even kill cells in the hippocampus, the area of the brain chiefly responsible for memory, and may also contribute to overall premature brain aging. According to some experts, elevated cortisol for extended periods can contribute to depression by causing changes in serotonin and other neurotransmitter levels. In addition, because cortisol keeps your blood pressure high it increases risk of stroke. A study of 600 stroke patients in a Swedish hospital found an independent link between self-perceived psychological stress and a type of stroke caused by either atherosclerosis or blood clots that have developed locally in the smaller vessels of the brain. A Swedish study which followed a large group of women for 35 years has linked psychological stress in middle age to dementia later on in life. The study defined psychological stress as �a sense of irritation, tension, nervousness, anxiety, fear or sleeping problems lasting a month or more due to work, health, family or other problems�. The study found the risk of dementia to be approximately 65% higher for women who reported repeated areas of stress in middle life. However, further research is needed to confirm the study results. Minimizing the level of chronic stress in one�s life is certainly a wise policy. However, controlling one's stress level is not always an easy thing to do. Therefore, coping effectively with chronically stressful situations will be addressed in a future article. While by no means an exhaustive list, following are a number of environmental toxins which can significantly affect brain function. These toxins also have many other deleterious effects on the body, but in the interest of brevity only their effects on the brain will be listed. Cigarette smoke � According to research done by the Laura Launer of Erasmus University Medical School in Rotterdam, Netherlands, smoking after age 65 may hasten mental decline by causing silent strokes which damage or destroy brain tissue. In addition, a Dutch study of approximately 7000 people aged 55 or older found that smokers were more than twice as likely as non-smokers to develop dementia and Alzheimer�s disease. PCBs (polychlorinated biphenyls) � PCBs, often referred to as chlorinated hydrocarbons, were used in hundreds of industrial and commercial applications until they were banned by the United States Congress in 1979 and by the Stockholm Convention on Persistent Organic Pollutants in 2001. Studies have suggested that exposure to PC�s can affect nervous system development in newborn babies, leading to problems with short term memory and learning. One key source of PCBs is farm-raised salmon, which is fed ground-up fish that have absorbed PCBs in the environment. Pesticides � Chem-tox.com cites a number of studies that link the following with common pesticides used in and around the home: fetal brain damage, Parkinson�s disease, neurological disorders and A.D.D. symptoms, damage to the bloodblood-brain barrier, and increased risk of brain cancer. Major sources include fruits, vegetables and commercially raised meats, lawn pesticides and bug sprays. Mould and other fungal toxins � There is some evidence linking mould with Multiple Sclerosis (MS). A 2010 study at the State University of New Jersey found MS may be triggered by immune system response to fungal infections related to both yeast infection and grain-based fungal toxins such as those found in contaminated wheat crops. However, further research in this area is required before a definitive causal connection can be made. Phthalates � Phthalates are chemicals added to plastics to increase flexibility, transparency, durability, and longevity. They are also used in a wide variety of other products, including enteric coatings for pharmaceutical pills and supplements. A comprehensive list of uses is available on Wikipedia. Phthalates are being phased out of Canada, the US and the European Union due to health concerns, including endocrine system damage. Major sources include plastic wrap, plastic bottles, plastic food storage containers, which are all capable of leaching phthalates into our food. VOCs (Volatile Organic Compounds) - VOCs consist of a variety of chemicals which are emitted as gasses from certain solids or liquids. According to the EPA, VOCs can be 2-5 times higher indoors versus outdoors, because so many household products contain them. The EPA also reports that VOCs are known to cause damage to the central nervous system (brain and spinal cord), as well as headaches, dizziness and loss of coordination. Household sources include paints, paint strippers and other solvents, wood preservatives, aerosol sprays, cleansers and disinfectants, moth repellents and air fresheners, stored fuels and automotive products, hobby supplies and dry-cleaned clothing. Dioxins � Dioxins are chemicals produced as a by-product of a number of manufacturing processes, including smelting, chlorine bleaching of paper pulp, production of herbicides and pesticides and incomplete burning of waste products. They can also result from natural disasters such as volcanic eruptions and forest fires. The World Health Organization reports that long term exposure to dioxins can lead to impairment of the immune system, the developing nervous system, the endocrine system and reproductive functions. Dioxins accumulate in the fatty tissues of animals and as a consequence more than 90% of human exposure is through consuming meat, dairy products, fish and shellfish. Heavy metals � Metals such as arsenic, mercury, lead, chromium and cadmium can accumulate in soft tissue in toxic levels, resulting in neurological disorders. According to Wikipedia, the most common source of heavy metal pollution arises from the purification of metals (i.e. the smelting of copper) and the preparation of nuclear fuels. Electroplating is the primary source of chromium and cadmium. When these metals are released into the air, they travel on the wind and eventually settle on the ground or in the water. Thus drinking water and fish can be a major source of human exposure. In addition, many lipsticks contain lead. Dental amalgams (a type of filling) contain mercury and there is ongoing debate whether these fillings are safe or not. Burnout. It�s a word we all use quite casually these days, as if it�s now a generally accepted and inevitable consequence of our modern lifestyle. Our nonchalant attitude that �everyone deals with it, that�s just the way it is� leads us to discount the truly debilitating effect burnout can have on an individual. Perhaps we all do suffer from excessive demands placed upon us to some degree, but true burnout is a much more serious problem that can literally destroy someone�s life by rendering them incapable of coping effectively with the normal demands of daily living. Burnout depletes a person to the point where they feel helpless, hopeless, angry, resentful, and unable to give one iota more of themselves to anyone or anything. That�s because burnout is more than simply being under a lot of stress. Stress in and of itself is not a bad thing, despite the negative connotation commonly associated with the word. In fact, stress is a normal and necessary part of living because without it we would not be motivated to overcome life�s challenges and achieve our goals. Stress is what pumps our blood, ignites our passion and gets our creative juices flowing. However, there is a limit to how long we can effectively operate in such an excited state, and so when the mind and body have been under too much stress for too long they no longer function properly. That�s when extended, ongoing stress starts to take its toll and eventually leads to complete and utter mental and physical exhaustion. Depending on the individual, this can result in depression, where someone feels disillusioned and helpless to change their situation because even what would normally be minor problems seem insurmountable. Alternatively, the consequence could be physical illness, either in the form of ongoing minor ailments (such as colds, body aches and pains) or something more serious like heart disease or cancer. How long before extended stress starts to take its toll depends on the individual, and that�s part of what makes it difficult to identify the telltale signs of impending burnout. Some people thrive on the excitement of being constantly busy and in demand by their boss, coworkers or family � they�re the ones who are least likely to recognize the warning signals. Arguably, they are also the ones who will be hardest hit by burnout, because not only will they continue to push themselves despite feeling tired or perhaps physically unwell, they will have an emotionally harder time coping with their mind�s inability to function at its normal peak efficiency. And like many other afflictions, the longer burnout goes undetected the longer it takes for both mind and body to recover. The physical and emotional health consequences of burnout should not be taken lightly. Burnout can threaten your job and financial security, your personal relationships with family and/or friends, and your physical health. Therefore, we all potentially have a lot to lose if we do not pay attention to the early warning signs of burnout and take immediate steps to protect ourselves. The earlier we identify a potential problem, the easier it is to resolve at minimum personal cost. We all have bad days on occasion where things aren�t going right and we feel a sense of frustration and perhaps even hopelessness. That�s perfectly normal, but when a person starts to feel that way more often than not, they may be on the road to burnout. Because burnout typically develops gradually, often we are not aware it�s creeping up on us until it�s impossible to ignore the fact that something is terribly wrong. The longer it takes to become aware of a burnout problem, the harder it is to take action against it. That�s because burnout attacks one�s ability to think both rationally and optimistically, which leads to a growing sense of helplessness and despair about one�s ability to make constructive changes that will improve their situation. So to help you recognize a potential problem as early as possible and thus minimize the potential consequences, here are some things to watch out for. Individual warning signs by themselves may be the cause of some other unrelated (and hopefully temporary) issue, but if you can relate to multiple items on this list then you might want to consider making some job or lifestyle changes to protect yourself from a full-scale case of burnout. In order to cope effectively with burnout, you need to understand its dynamics so that you better understand why you feel the way you do and don�t beat yourself up too badly for feeling that way. True burnout is complete emotional, mental and physical exhaustion caused by excessive and prolonged stress. In other words, your mind and body have been completely overwhelmed by your life situation and no longer have the capacity to cope with it. A key problem with asking a non-trained, non-professional for help is that they may not fully understand the dynamics of burnout. Burnout is not the same thing as being under too much stress. While burnout is caused by excessive and prolonged stress, a person can be extremely stressed yet still be functional. The main difference is this: A stressed person, despite feeling like they have too much pressure and too much to do, can still visualize feeling better if they can just get things under control. A burned out person, on the other hand, is no longer capable of visualizing things will be okay, even if their current stressors were to magically disappear. Being burned out means feeling empty, devoid of motivation, and beyond caring. So while stress may kill you prematurely, burnout will make you feel that life is not worth living. A non-professional, therefore, may well become frustrated with a burned out person�s continued feelings of hopelessness, even though they�ve just helped them resolve all their problems. This only adds to the depression, guilt and sense of failure the burned out person is already feeling. If you are such a person, it is important not to feel guilty or believe you are somehow a failure for feeling the way you do. Your present inability to cope is a direct result of past overachievements, not because you were a loser. Keep in mind that burnout is not for the faint of heart � many people would have given up on everything much earlier and never have pushed themselves hard enough to achieve your degree of burnout. What you did to yourself took tenacity and dedication, two very admirable qualities that will serve you well in the future, once you get life back into perspective and learn some helpful techniques to prevent burnout from recurring in the future. But for the immediate present, you first need to slow down by cutting back on what commitments and activities you can so that you have time to rest, reflect and heal. Be honest with your family and friends about what has happened and ask for their support (but not necessarily their advice). View your present situation as a wake up call to re-evaluate your goals and priorities so that you can begin directing your energy towards what will make you truly happy. Give some careful thought as to how you can live a more balanced lifestyle so that history does not repeat itself. Learn to set boundaries and say �no� to avoid over-extending yourself. (Then you can say �yes� to the things you truly want to do.) You need to be realistic about how much you can accomplish in a day so that you can learn to work smarter, not longer. Develop and maintain clear boundaries between your work and personal lives. You need to turn off and tune out in order to properly rest, recuperate and keep these two lives in perspective. If you start to feel overwhelmed by your current demands, don�t be afraid to ask for help. Understand and respect your limitations, and insist that others do the same. Ask to be involved in decisions that affect you so that you can maintain more control over your workload schedule. Ensure you get adequate sleep so that you can be more productive and better able to cope with stress. Eat healthily, drink plenty of water and exercise regularly so that your body can physically cope with the demands you place on it. If you�re going to work hard, learn to play hard too. Find a creative outlet, preferably non-work related, to alleviate stress and recharge your batteries by doing something you find mentally stimulating and which brings you pleasure. Find a profession and a work environment which fit with your values and philosophical viewpoint so that your work is as rewarding as possible. This way even if you�re extremely busy, you�ll still feel enthusiastic about what you�re doing. If you haven�t the foggiest notion of what you�d really like to do, consider seeking the professional advice a career counselor. Learn to take regular breaks from your day to day responsibilities. Don�t work through lunch, if you use public transit then read a good book while en route, don�t check your emails evenings and weekends and be sure to take regular vacations. Ensure you have enough variety in your work and your personal life to keep both interesting and rewarding. Clearly identify your priorities and organize your schedule around them. Be disciplined about not allowing life�s little distractions to pull you from the truly important things. This applies to both your personal and professional lives. Ensure you have adequate opportunities for personal growth and advancement, whether that be on the job or in your private life. Make a list of the things you like the least about your job and/or at home. Dispense with or delegate as many items as you can. Do what you can to change things in your life that bother you and learn to accept the annoyances you can�t change. Learn stress reduction and life centering techniques that are most helpful for you, whether that be deep breathing techniques, yoga, meditation, reading, writing in a journal, etc. Build a support system with individuals who will help look for solutions to problems as opposed to simply gripe about them. Avoid negative thinkers or people who drain you and actively seek more positive, happy people to associate with instead. In my opinion, most people fail to fully understand or appreciate the true nature of burnout and so tend to overlook the devastating effect it can have on an individual, as well as its overall cost to society in general. People thus leave themselves open and vulnerable to burnout and its potentially serious repercussions for both themselves and those closest to them. *Includes quiz for determining whether you are a candidate for burnout. Oral hygiene, or proper care of your teeth and gums, is about much more than having fresh breath and a beautiful white smile, although of course both fresh breath and a nice smile are important to image enhancement and self confidence. Cavities � Within 20 minutes of eating, plaque begins to form on your teeth, and if not removed daily, it hardens into calculus or tartar. The bacteria in both plaque and tartar quickly turn foods such as sugars and starches into decay-producing acid which dissolves the enamel on the surface of the tooth. The result is a hole, or cavity. When the dentinal tubules become exposed, toothache will ensue. Most cavities occur between the teeth or along the gumline, where it is most difficult to remove plaque through regular brushing. Periodontitis � This is the second stage of gum disease, where supporting bone and connective tissue are destroyed by ongoing bacterial infection. Gums start to ulcerate and pull away from the teeth, which creates additional pockets for food and bacteria to collect, thus exacerbating the problem. Advanced Periodontitis � This is the final stage of gum disease, where bone and tissue are destroyed to the point where the teeth start to loosen and fit together differently. A number of roots may be exposed, making the teeth sensitive to hot and cold food or drink. Bad breath will be clearly detectable and in addition some people may experience a constant metallic taste due to extensive tooth decay. At this point even aggressive treatment may not be enough and teeth will have to be removed. Cardiovascular disease � There is some evidence to indicate that bacteria can enter the bloodstream through the mouth and possibly attach to fatty deposits in the heart blood vessels, which could produce blood clots and a corresponding heart attack. There is also evidence that the bacteria which causes the inflammation associated with periodontitis can also cause the same thickening of blood vessel walls commonly associated with heart disease. A recent study examined 650 people and concluded there was a relationship between an increased level of blood vessel thickening and the presence of the bacteria found in dental plaque known to cause periodontitis. Diabetes complications � People with diabetes are at higher risk for gum disease than those who are not diabetic, particularly if blood sugar levels are not being adequately controlled. Not only do high glucose levels in saliva provide an ideal environment for bacteria to thrive, diabetes also reduces the body�s ability to fight infection. Therefore, diabetics tend to develop periodontal disease more often and more severely, and they lose more teeth than people who have good control over their diabetes. Diabetics can also suffer from �dry mouth�, which further increases the risk of gum disease. Saliva helps wash away food particles and keeps the mouth moist. Constant dryness can irritate and inflame the soft tissues in the mouth, which greatly increases risk of tooth decay, gingivitis and periodontitis. Respiratory disease � It�s been found that the same bacteria which cause respiratory diseases such as bacterial pneumonia are present in dental plaque. More than one study has shown that residents of long-term care facilities who receive daily oral hygiene do not develop as many respiratory conditions as those who are not privy to the same level of dental care. Low birth weight babies � According to the American Academy of Periodontology, a study of 3576 Turkish women found that those with periodontal disease were at a greater risk for having low birth weight and preterm birth babies than those without periodontal disease. Another study indicated that treating a pregnant woman�s periodontal disease reduced her risk of delivering prematurely by about 50%. It has been found that pregnant women who have periodontal disease may be seven times more likely to have a baby that is born too early and too small. Periodontal disease appears to increase the level of labour-inducing fluids within the body, and data suggests that if periodontal disease worsens during pregnancy, risk of premature birth further increases. Rheumatoid arthritis � Although there is no hard evidence linking rheumatoid arthritis to periodontitis, or vice versa, both conditions are inflammatory in nature and produce tissue damage and loss. One school of thought is that these similarities may indicate an association between the two diseases, in that one may influence the other. If this is the case, poor orally hygiene could theoretically worsen the symptoms of rheumatoid arthritis. Though the consequences of gum disease can be severe, the good news is that gum disease can be reversed if it is caught early enough, before permanent damage is done to either bone or connective tissue. It is therefore important to brush and floss on a daily basis, as well as visit your dentist regularly. During pregnancy, increased hormone levels can lead to red, swollen and tender gums that often bleed when the teeth are brushed, even though there may be very little plaque present. According to the American Academy of Periodontology, approximately 50% of women experience pregnancy gingivitis, which is most common between the second to eighth month of pregnancy. This condition should be monitored by a dentist and more frequent dental cleanings may be necessary so that the gingivitis does not advance to periodontal disease. As noted above, periodontal disease can increase the risk of delivering premature, low birth weight babies. Dr. Azeem Sheikh (my Dentist) has advised me that in addition to gingivitis, some pregnant women will experience pyogenic granulomas, which are cyst-like growths in the mouth that can be quite painful and often bleed profusely with very little trauma. These �cysts� are benign and eventually subside on their own. Some women tend to brush their teeth less regularly during pregnancy due to nausea - using an all natural baking soda toothpaste may help. Brushing may also be painful - using a soft bristled toothbrush with gentle pressure will alleviate this problem as much as possible. Despite the pain and/or nausea, it is critically important to brush regularly to ensure teeth and gums remain as healthy as possible. Interestingly enough, a 2004 study indicates that women may experience different levels of gingival inflammation depending where they are in their monthly cycle. Inflammation was lower during menstruation than during either ovulation or pre-menstruation, which coincided with the rise and fall of estrogen in the body. Because oral contraceptives elevate hormones to simulate pregnancy (and prevent ovulation), women taking oral contraceptives may also experience symptoms similar to pregnancy gingivitis. (Once the oral contraceptive is stopped, the gingivitis will generally subside.) The good news is that today�s contraceptives contain much lower hormone levels than in the past, which is likely why more recent studies have found that gingivitis as a side effect of oral contraceptives is not as much of an issue as it used to be. There is a lot of interesting instructional material on the internet, which you may wish to show your children so they start to develop good oral hygiene habits from childhood. One thing you may wish to consider is a good quality, dentist recommended electric toothbrush. I was diagnosed with the early stages of gum disease a few years back, and after some intensive cleaning by my dental hygienist, my Rota-dent toothbrush (along with regular daily flossing) has done an amazing job at keeping my teeth clean and plaque free between checkups. It wasn�t cheap, but it has definitely been worth the investment. According to ehow.com, the Rota-dent electric toothbrush is one of the best you can buy because it reaches underneath the gum line and in between the teeth more effectively than other brushes. It's my understanding that Rota-dent toothbrushes are available only through professional dental offices. Flossing should be done at least once per day, and preferably after every meal. You must take care to slide the floss up into the gum line (without damaging the gum!) in order to catch food particles that become wedged there. Both Colgate and The British Dental Association�s web site contain demonstrations of flossing technique. If you have wide spaces between your teeth, you might try using dental tape -- a wider variety of floss. Exhale through your mouth while brushing your tongue. Breathe in and out deeply. Avoid holding your breath, or concentrating on breathing one way or the other, as it will make things worse. Push the tongue down hard into the lower part of the mouth behind the teeth. This will give you some "extra time" in between. As soon as the tongue starts to wobble, then stop, give it a few moments to retrieve your strength and try again. Hold your toothbrush perpendicular to your tongue--brushing from the side. Putting your toothbrush in the long way will make it easier to 'slip' into the danger zone and is also more psychologically invasive (makes you think of gagging). Always remember to drink plenty of water. Not only does water help wash away food particles, if you are well hydrated you will have ample amounts of saliva that does the same thing. Saliva also contains buffers which neutralize the acid caused by bacteria, as well as minerals like phosphorus and calcium which play a role in helping to reform tooth enamel. Choose fruits and vegetables containing a high volume of water, such as pears, melons, celery, and cucumbers as 'healthy snacks' instead of sweet snacks. Note that harder foods stimulate greater saliva production and therefore help with �self cleaning� of the teeth. Finishing your meal with yellow cheese helps neutralize the acids in your mouth, especially after consuming sweet foods. Nuts apparently also have acid neutralizing tendencies, but nuts are generally quite high in fat (as is cheese) and so eating them habitually could promote weight gain. A number of authorities suggest chewing sugar free gum between meals to help stimulate saliva to remove food particles and neutralize bacterial acid. However, sugar free gum contains Aspartame, which is an excitotoxin that has the potential to damage the same areas of our brain which are affected by neurodegenerative diseases such as Alzheimer�s, Parkinson�s, ALS or Huntingdon�s disease. This has lead some scientists to hypothesize that cumulative, long term exposure to aspartame could under certain conditions trigger any of the above diseases. But this connection has been difficult to prove and so the jury is still out. Carbohydrates are composed of starches and sugars which tend to stick to teeth and interact with bacteria to produce plaque. (Fats and proteins do not stimulate plaque production, so they do not contribute to tooth decay.) Carbohydrates are best eaten as part of a full meal as opposed to between meals (i.e. snacks) because the greater saliva production during meals will help neutralize their plaque forming tendencies. Fruits, milk, cereals, bread and some vegetables contain sugars and/or starches. Generally, the stickier the food, the more it will promote plaque production. Snacks such as chips and crackers adhere longer to the teeth than jelly beans or caramels � jelly beans and caramels contain soluble sugars which are washed away by saliva more quickly than foods such as bread, chips or crackers. Acidic foods, drinks or medicines can erode the outer surface of the teeth and allow cavities to develop. Acidic foods include fruits (especially citrus fruits) and their juices, vinegary foods such as pickles, and fruit based or carbonated soft drinks. Smoking impairs blood flow within the body, including teeth and gums. This not only reduces your body�s immune system to fight plaque causing bacteria, it also increases the amount of time it takes for your gums to heal after gingivitis or peridontitis has been treated. Aside from this very serious health issue, nicotine stains your teeth and thus detracts from your appearance. The importance of correct posture should never be underestimated. Aside from making you look younger and appear more vibrant, confident and successful, proper posture provides significant health benefits that will allow you to better live life to the fullest even as you age. When your body is properly aligned it can move freely without pain and operate at peak efficiency because minimum strain is placed on supporting muscles, joints and ligaments. In fact, according to the Posture Theory, �improving posture relieves pressure on the back, chest, heart, lungs, stomach, and blood stream, and therefore reduces the incidence of back ache, chest pains, palpitations, breathlessness, and fatigue, and improves digestion, physical development, and the sense of wellbeing�. Conversely, poor posture can lead to much of the stiffness, aches and pains we normally attribute to aging. It can also increase stress on the joints and discs in the back, leading eventually to arthritis. Headaches, eyestrain, and jaw, neck and upper back pain can be caused by the head being out of correct alignment with the rest of the body. Pelvic joint disorders can cause lower back or knee pain. Hunched or stooped shoulders can restrict breathing and make existing problems such as asthma much worse. According to the January 1994 issue of the American Journal of Pain Management, poor posture is evident in patients with chronic pain related conditions including lower back pain, neck related headaches, and stress-related illnesses. Quite frankly, it�s hard to be all you can be when you�re in pain. If anyone has ever experienced chronic back pain, you�ll know exactly what I mean as I speak from experience. When you can�t escape it, it eventually wears you down so that it�s impossible to concentrate, or to be positive and enthusiastic about anything. The good news is that even if your posture has been problematic for some time, you can still make improvements, regardless of age. Through correcting your posture you may be able to restore proper body function and eliminate pain and stiffness altogether, or at the very least prevent additional injury from occurring. Physical trauma, such as car accident or sports injury, where pain leads to muscle guarding and positioning the body to avoid pain. Emotional stress, where constant tension in the body eventually pulls things out of alignment. Low self esteem, where an individual habitually shrinks into themselves as opposed to standing tall and straight. Habitually holding the body in a misaligned position due to repetitive action, such as being hunched over a computer keyboard for extended periods. Muscle imbalance, spasms or tightness, which interferes with normal healthy movements. Muscle weakness from lack of exercise, so that muscles can no longer adequately support the joints. Joint issues, where movement is either too stiff or too loose. Structural deformities, such as unequal leg lengths. Deformation caused by normal degenerative processes (loss of bone density) or disease. Over reliance on support from non-ergonomic chairs, so that over time your body grows too weak to independently support itself. Excess body weight, which puts excess strain on joints and ligaments so that they can no longer function properly. Faulty posture can often start in childhood and be carried forward into one�s adult years before any noticeable problems materialize. Slouching feels relaxed and comfortable, and so it�s not readily apparent to someone if they aren�t standing or sitting properly. Because it takes a number of years for chronic symptoms to develop, significant damage to the body can occur before the problem is diagnosed and corrected. Slouching or forward head posture (your ears should be in line with your shoulders) � causes strain on the posterior (rear) neck muscles and increases weight bearing on the discs, leading to premature arthritis of the neck. For every inch that the head moves forward in posture, it increases the weight of the head on the neck by 10 pounds. Forward tilt of the pelvis � increases the degree of curve in the lower back, which could result in lower back pain, leg weakness, circulatory issues, and premature spinal arthritis (joints and discs). Tilting of the head or neck (chin should be parallel to the floor) � evidence of strain or stress on the spine. One shoulder lower than the other � indicating sideways curvature of the spine. One arm further out from the body than the other � forcing the rest of the body to compensate ever so slightly to maintain balance. The hands not in line with the hips � if your hands fall too far forward, your shoulders may be hunched or rounded. One hip lower than the other � could indicate different leg lengths, which can create sideways curvature of the spine. Spine abnormally stooping or S shaped when in a relaxed stance � can determine this by looking sideways in a mirror. Outward turning of one or both ankles or feet � improper foot alignment affects spinal posture. Have your posture evaluated by a chiropractor or physiotherapist and get professional advice regarding how to fix any underlying problems so future pain and suffering can be avoided. Strengthen your muscles through Yoga, Pilates or weight lifting. In order to properly support the upper body and maintain good posture, back muscles should be about 30% stronger than abdominal muscles. Practice good nutrition habits so that muscle strength and bone mass are not compromised. Use the right height seating so that your feet can be placed flat on the floor for support. The back rest of the chair should be slightly inclined backwards, and have a slight curve in the mid to lower back area to support that natural slight curve in the lower spine. Consider using footrests, portable lumbar back supports, or even a towel or small pillow to create an ergonomically friendly position while sitting in an office chair or while driving. Desk height should be such that you do not have to lean forward to read (but if you do lean, do so from the hips and not the waist). Keyboard and mouse should be level with the forearm when it is parallel to the ground so the wrist does not bend (which can interfere with blood supply to the hand). When writing, try to minimize twisting of the spine and breastbone (which happens when you use one hand � it is therefore better to use a computer keyboard when possible, which requires 2 hands more or less equally). Wear proper corrective eyewear and position your computer screen to your natural resting eye position to avoid leaning or straining the neck by tilting the head forward. Avoid carrying heavy purses over one shoulder, which could lead to sideways curvature of the spine. Your children should avoid carrying heavy school books in satchels or duffle bags; a knapsack balanced across the back is a much safer alternative. If one leg is longer than the other, use shoe inserts or orthopedic shoes to compensate for the length variance. Learn to recognize the warning signs of back pain caused by poor posture � pain that is worse at certain times of the day than others, pain that starts at the neck and moves down into the upper back, lower back and extremities, pain that goes away after switching positions while sitting or standing; sudden back pain that is experienced with a new job, a new office chair, or a new car; and/or back pain that comes and goes for months. Change positions frequently to avoid slouching due to tired muscles. When sitting or standing in one position for any length of time, take a two minute break to take a brief walk or do some stretching exercises. Avoid unbalanced postures such as crossing legs unevenly while sitting, leaning to one side, hunching the shoulders forward or tilting the head. Try to keep your body evenly aligned when sitting or standing. When lifting heavy items, bend your knees and keep your back straight, then lift with your knees rather than with your back. Many back injuries occur when someone carelessly reaches for something without thinking, so be conscious of your movements at all times. Check out this great video which shows a simple exercise you can do daily to help prevent your shoulders from stooping forward. The following section has been �borrowed� and abbreviated from Cleveland Clinic. The more detailed version is definitely worth the read as it contains visual illustrations of correct versus common problem postures, as well as correct sitting and lifting positions. Sit with your back straight, your shoulders back and your buttocks touching the back of your chair. All three normal back curves (cervical, thoracic and lumbar) should be present while sitting. A small, rolled-up towel or a lumbar roll can be used to help you maintain the normal curves in your back. Bend knees at a right angle, keeping them even with or slightly higher than your hips. (Use a foot rest or stool if necessary.) Legs should not be crossed. When standing up from the sitting position, move to the front of the seat of your chair. Stand up by straightening your legs. Avoid bending forward at your waist. Keep your back straight and bend at your knees and hips. Stand with a wide stance close to the object you are trying to pick up and keep your feet firm on the ground. Straighten your knees in a steady motion. Don't jerk the object up to your body. Slide it to the edge to the table so that you can hold it close to your body. Bend your knees so that you are close to the object. Use your legs to lift the object and come to a standing position. Regardless of sleeping position, your pillow should be under your head, but not your shoulders, and should be a thickness that allows your head to be in a normal position. Sleeping on your stomach, especially on a saggy mattress, can cause back strain and can be uncomfortable for your neck. Tuck your stomach in. Do not tilt your pelvis forward. The arches in your feet should be supported. Bring your feet parallel, not turned out, and about hip width apart. Bringing your feet parallel engages the muscles in the front of your thighs and keeps your hips, knees and ankles in proper alignment. Reach up through the top of your head, feeling your spine lengthen, getting tall. Bring your pelvis to a neutral position. To find this neutral position, place your hands around your hips, then tuck your tailbone slightly until your pelvis is directly over your thighs, so there is no bend in your hip joints, and there's less sway in your low back. As you tuck your tailbone, you should feel your abdominal muscles engage a bit. Draw your shoulders back and relax them down, bringing your hands in line with the seams of your pants. Level your chin, keeping your head directly over the spot between your shoulders, not forward or back. Getting an adequate amount of rest each night is critical to remaining healthy, particularly given the hectic pace and stressful environment of today�s modern woman. Too little sleep will lead to physical, mental and emotional breakdown, and in extreme situations it can even kill you. Research has shown that when rats are totally deprived of sleep they only live about 5 weeks instead of their usual 2-3 year lifespan. Quality of sleep is as equally important as quantity. Odds are if your sleep is interrupted, you get up several times in the night or you toss and turn a lot, you�re not getting enough �deep sleep� (stages 3 & 4) to feel fully refreshed the next morning or enough REM sleep (rapid eye movement, dream stage) for the brain to function fully upon awakening. I think just about all of us are somewhat sleep deprived in this day and age, particularly working mothers. With so many hats to wear and too few hours in a day to do all that we need to do, quite often it�s our sleep time that suffers. However, getting the proper amount of sleep is critical to your health and well being in so many key ways that we do need to make it a priority, as difficult as that sometimes seems. According to Mark Mahowald, professor of neurology at the University of Minnesota Medical School, in simulated driving tests one full night of sleep deprivation is as impairing as legally intoxicating blood-alcohol levels. Sleep deficit, or lack of adequate sleep, can impair reaction time, judgment, vision, information processing, short-term memory, performance, motivation, vigilance and patience. People who are tired also experience greater degrees of moodiness, stress and burnout, as well as exhibit more aggressive behaviour. More energy � A good night�s sleep allows you to feel more energized and alert the following day, so that you can get more done during a given amount of time and feel better while doing it. More positive attitude � If you don�t get enough sleep, your brain doesn�t release enough serotonin, which can lead to feelings of depression. Improved concentration � Researchers believe that our neurons can shut down while we sleep and repair any damage done to them during the day. If the repairs are not made the neurons may not function correctly due to a build up of waste products. In fact, when humans are deprived of sleep for too long, we start to hallucinate and can develop other mental problems such as depression or schizophrenia. Improved memory � Although scientists do not know the entire purpose of the REM sleep stage, they are fairly certain it helps in the proper creation of long term memories. So more sleep will help you remember things better. In fact, it�s been suggested that when preparing for exams, you would be better off reviewing your notes until you were tired and then getting a good night�s sleep as versus reviewing your notes over and over again all night. Lower body weight � Research has shown that people who sleep less than 7 hours per night are more likely to be overweight. Scientists believe this is because lack of sleep affects the body�s level of two hormones (ghrelin and leptin) which are important for regulation of appetite and cause us to crave high calorie items loaded with fats and carbohydrates. Less internal inflammation � Lack of sleep causes an increase in stress hormones, which makes it harder for you to fall asleep once you do try to get some shuteye. These stress hormones, which tend to be elevated in our bodies anyway due to today�s fast-paced lifestyle, have also been associated with increased inflammation (immune reaction) at a cellular level. Inflammation has been linked to the aging and degeneration of our organs, cells and other body parts, manifesting in such things as wrinkles, arthritis, heart disease and cancer. Lower risk of heart disease � These same stress hormones and related inflammation can cause an increase in blood pressure as well as cholesterol levels, which in turn increases the risk of heart attack or stroke. Lower risk of cancer � Melatonin, a hormone which appears to suppress the growth of tumors, is produced by our bodies in largest quantities during periods of darkness. Scientists believe the reason why night shift workers have higher incidences of breast and colon cancer is because their melatonin levels are lower due to exposure to light late at night. Lower risk of diabetes � People who do not get enough sleep can become less sensitive to insulin, which increases their risk of diabetes. In addition, animal studies have shown that sleep enhances the development of new brain connections during a period of early development. Therefore, adequate sleep in children may well be critical to the full and proper development of their brains. A university study of 500 pre-schoolers found that those who slept less than 10 hours in a 24 hour period (including naps) were 25% more likely to misbehave and were consistently at greatest risk for acting out aggressively or engaging in oppositional or non-compliant behaviour. Getting enough sleep, as you can see, is absolutely critical to maximizing overall health and well-being, no matter what anyone's age. So now might be a good time to critically evaluate whether you and your family are currently getting enough sleep each night, not only to meet your daily needs, but also to ensure long term health maintenance and disease prevention. An extra hour of sleep each night over the long term could well be the difference between aging gracefully and experiencing debilitating health problems as you grow older. With the recent outbreaks of SARS and swine flu, people in general are becoming more conscious about protecting themselves against cold and flu viruses. Following is some basic information about cold and flu viruses, as well as 30 practical steps you can implement immediately to help protect yourself from them. While the common cold can be caused by one of over 200 different viruses, the rhinovirus �family� (there are over 100 different strains of the rhinovirus) is responsible for up to 35% of all colds. Rhinoviruses are most active in early fall, spring and summer, and can live up to 3 hours on your skin as well as objects such as door knobs. Most cold viruses live best in the low humidity conditions which occur during the colder months of the year. Unfortunately, this is also when the inside lining of your nose is drier and thus more vulnerable to viral infection. The two most common ways of catching a cold are by rubbing your eyes or nose after touching an infected surface (door knob, telephone, etc.) and inhaling drops of mucus full of cold germs from the air (i.e. when someone in front of you sneezes). Psychological stress or allergic diseases affecting the nose or throat may increase the risk of catching a cold after being exposed to cold germs. Cold symptoms usually begin 2 to 3 days after infection and can include mucus buildup in your nose, swelling of your sinuses, sneezing, sore throat, cough, headache and fever. Though in adults any fever is generally mild, it can be quite high in infants and young children. A high fever, significantly swollen glands, severe sinus pain or a cough that produces mucus may indicate a complication or more serious illness that needs to be evaluated by your doctor. Just like the common cold, influenza is a respiratory infection caused by viruses, but the symptoms are different. Fever, headaches and extreme exhaustion are common flu symptoms usually not experienced by cold sufferers. Flu season typically runs from November to March and during an outbreak the virus can affect up to half the population of a community. Families most affected are those with school aged children, because children are more vulnerable and thus it spreads quite quickly from child to child in a classroom setting. Although healthy people generally recover in about a week, they may have a lingering cough and/or tire easily for a longer while. Elderly people, newborns and people with certain chronic illnesses can experience serious, life threatening complications. Flu viruses are contracted the same way as cold viruses � by touching a contaminated surface and then touching your face, or by breathing in the virus after someone has sneezed or coughed. The denser the population, the higher the risk of infection. People are contagious prior to feeling symptoms and for about 3 to 4 days after the first symptoms appear. Symptoms generally appear within 1 to 4 days and include body aches, chills, dry cough, fever, headache, sore throat and/or stuffy nose. The stomach and intestines are almost never affected, so what is sometimes called stomach flu is not influenza. Complications include possible bacterial infection leading to pneumonia. Complications generally occur after you start to feel better. High fever, shaking chills, chest pain with each breath and coughing that produces thick, yellow-greenish-coloured mucus are indicative of possible pneumonia, which can be quite serious and needs to be treated by a physician immediately. Reye�s syndrome is a potential complication in children and teenagers. It generally starts with nausea and vomiting, and leads to confusion or delirium as well as brain or liver damage. Other potential complications for children include convulsions caused by fever, croup and ear infections. Newborn babies recently out of intensive care units are particularly vulnerable to suffering from flu complications. Avoid touching doors and other objects that are regularly handled by the general public � viruses (and other germs) can live on these surfaces for up to several hours, so if you were to open the door to a restaurant and then rub your eyes you could potentially infect yourself. (So next time someone holds the door open for you, be sure to thank them as you take them up on their offer!) Similarly, if you wash your hands in a public restroom after using the facilities, use a paper towel to turn off the faucet. Use another paper towel to dry your hands and then use it to open the door. For extra precaution, wash your hands immediately upon returning home if you�ve just spent time in a public place. Carry a hand sanitizer in your purse - (or hip pocket or glove compartment) for emergency (and perhaps inconspicuous) use when you can�t get to a bathroom to wash your hands. A little dab will kill 99.99% of germs without any water or towels. It uses alcohols to destroy germs physically and is an antiseptic, not an antibiotic, so resistance can't develop. Some brands come with moisturizers and vitamin E to counteract the drying tendency of the alcohols. Children may be more receptive to using sanitizers as opposed to regular hand washing because it�s �fun�, so if you�re concerned that your children�s sanitary practices are not up to par you may want to introduce them to their very own hand sanitizer pump. Don't cover sneezes and coughs with your hands � the germs will cling to your bare hands and you are therefore more likely to spread your virus to family, friends and colleagues. Sneeze or cough into a tissue instead and then throw it out immediately. If you don�t have a tissue, you can turn your head into your folded elbow to stop the spread of germs, or if you�re not comfortable sneezing or coughing on yourself, then simply turn your head away from anyone near you and cough into the air. Wipe your nose as opposed to blowing it � blowing your nose forces some of the virus infested mucous back up into your sinuses. (This was discovered using dye and X rays.) If you need to blow, blow gently, and blow one nostril at a time. Avoid touching your face � cold or flu virus can enter the body through the nose, eyes or mouth. The average person apparently rubs his eyes or nose or scratches his face 20-50 times a day, so try to be aware and consciously limit the number of times your hand goes to your face. If you absolutely must, use your knuckle to rub your eye � it's less likely to be contaminated with viruses than your fingertip. Drink lots of fluids � water flushes the poisons from your system as it rehydrates you. A typical adult needs approximately 8 glasses of water a day. You can tell you�re getting enough fluids if your urine is clear or almost clear; if you�re dehydrated your urine will be a deep yellow. Take a sauna � a 1989 German study founds that people who sat in the sauna twice a week got half as many colds as those who didn�t. And an Austrian study published in 1990 found that volunteers who frequently used a sauna had half the rate of colds during the six-month study period than those who didn't use a sauna at all. Although the exact reason for the reduced number of colds wasn�t precisely determined, it�s thought that inhaling hot air would have killed any invading virus as neither cold nor flu viruses can survive in temperatures hotter than 80� F. Most gyms have saunas these days so access to one is relatively easy. Inhale air from your blow-dryer � sounds a little nuts, but one study conducted at Harvard Hospital in England found that people who breathed heated air had half the cold symptoms of people who inhaled air at room temperature. Set the dryer on warm, not hot, and hold it at least 18 inches from your face. Breathe in the air through your nose for as long as you can, ideally for about 20 minutes. Get plenty of fresh air � particularly in cold weather because central heating dries out your nasal passages, leaving you more vulnerable to cold and flu viruses. Also, more germs will likely be circulating in crowded, dry rooms. Exercise regularly � aerobic exercise increases heart and respiratory rates and makes you sweat once your body heats up, which increases the body�s natural virus-killing cells. Eat plenty of fresh fruits and vegetables containing phytochemicals � phytochemicals are natural chemicals in dark green, red and yellow vegetables and fruits that protect the plant against disease, and it�s now believed that we can now enjoy these same health benefits by eating plants high in phytochemicals. Phytochemical-rich foods include cruciferous vegetables (e.g., broccoli, Brussels sprouts, cauliflower, cabbage), umbelliferous vegetables (e.g., carrots, celery, parsley, parsnips), allium vegetables (e.g., garlic, onions, leek), berries, citrus fruits, whole grains, and legumes (e.g., soybeans, beans, lentils, peanuts). Eat yogurt � a study from the University of California-Davis found that people who ate one cup of yogurt (whether live culture or pasteurized) had 25 percent fewer colds than non-yogurt eaters. Starting in the summer builds up immunity prior to the cold and flu season. It�s possible the beneficial bacteria in yogurt stimulates the immune system. Avoid smoking and second hand smoke � Studies show that heavy smokers get more frequent colds and their colds are generally more severe. Smoking dries out the nasal passages and paralyzes cilia (delicate hairs lining the mucous membranes in the nose and lungs which sweep cold and flu viruses out of the nasal passages) for as much as 30 or 40 minutes. Keep alcohol consumption to a minimum � alcohol dehydrates the body and suppresses the immune system, making heavy drinkers more prone to initial infections as well as secondary complications. Learn to meditate � there is some evidence to indicate that when we relax our level of interleukins (key to an effective immune system) in the bloodstream increases. In contrast, stressed people catch up to twice as many colds as non-stressed people. So once a day, sit in a quiet, dim room, close your eyes, and focus on one word. Note that this type of relaxation is a learned skill and that it is not doing nothing. People who try to relax, but are in fact bored, show no change in blood chemicals. Breastfeed your babies � breast milk protects against respiratory infections for years into the future. Children who are not breastfed average five times more ear infections. Get enough sleep � our immune system activates during deep sleep (which is why people tend to sleep longer when they�re sick). Ensure your zinc intake is adequate � zinc has a wide number of health benefits, including regulation of a wide variety of immune system functions and possible stimulation of anti-viral activity (remember, colds and flus are caused by viruses). Most people do get enough zinc in their diet � visit the Office of Dietary Supplements� Dietary Supplement Fact Sheet on Zinc for more information about the many health benefits of zinc as well as recommended daily intakes. If after reading the Fact Sheet you are tempted to supplement your zinc intake, please be careful: zinc toxicity can cause diarrhea, dizziness, drowsiness, vomiting, loss of muscle coordination and lethargy, as well as other complications. Do not use any vitamin or mineral in children under 2 years of age unless first discussed with your healthcare professional. Ensure your child�s daycare follows good sanitary practices � if not, cold and flu viruses will be spread from child to child and yours will bring these viruses home to you! Ensure that hand washing before and after eating, drinking, blowing noses, coughing or sneezing, etc. is enforced with the children and that the daycare providers are also following these same rules, and also ensure the facility is using disposable paper towels as opposed to common hand towels. If sleeping mats are used, how often are they wiped down with a disinfecting solution and how often are blankets and pillows washed? Get a flu shot (or nasal spray equivalent) each year � flu shots contain killed viruses that trigger the body to develop protective antibodies against them so that if you should be exposed to an equivalent live virus your immune system already knows how to fight it off. Because the flu shot contains killed viruses you can�t get the flu from the flu shot. However, it does take up to two weeks for your body to produce the antibodies for the virus, so you could still potentially come down with the flu in the interim. That�s why it�s recommended that you get the flu shot as early in the season as possible. (Nasal sprays contained weakened live viruses and thus are only suitable for use in healthy people.) Note that the flu shot contains only a limited number of flu viruses, and the ones included are based on information about recently circulating strains. Therefore it�s still possible to be infected by a flu virus that hasn�t been included in the vaccine. That�s why health care professionals recommend you get a flu shot every year, as viruses chosen for the flu shots will never be identical from year to year. The Centers for Disease Control recommends flu shots for anyone 50 years old or older, residents of long-term care facilities, people of any age who have chronic medical problems (heart or lung disease, asthma, diabetes, etc. ), pregnant women, and people whose immune systems have been weakened (by cancer, AIDS, or other causes). Also, people who work or live with a high-risk person should get a flu shot so they don't spread the flu. And of course anyone who just wants to avoid the flu should also get one. Stop blaming yourself when things go wrong - believe it or not, researchers found blaming yourself makes you more likely to catch a cold when they studied more than 200 workers over three months. It could be because it makes people more stressed on the job, and stress can challenge the immune system. Put a box of tissues wherever people sit - around the house, your workplace, your car. With tissues widely available anyone who has to cough or sneeze or blow his nose can do so in the way least likely to spread germs. Leave the windows in your house open a crack in winter � particularly in those rooms where you spend the most time. This is particularly important if you live in a newer home, where fresh circulating air has been the victim of energy efficiency. A bit of fresh air will do wonders for chasing out germs and will help counteract the drying effect of forced air heating, so that your nasal passages will be less susceptible to invading viruses. Lower the heat in your house 5 degrees - the dry air of an overheated home provides the perfect environment for cold viruses to thrive, and when your mucous membranes (i.e., nose, mouth, and tonsils) dry out, they can't trap those germs very well. Lowering the temperature and using a room humidifier helps maintain a healthier level of humidity in the winter. However, do not let the humidity climb beyond 60% because that�s when mold and mildew may start. 50% is ideal and you can purchase a hygrometer to measure humidity. Scrub under your fingernails every night � they�re a great breeding ground for germs. Don't pressure your doctor for antibiotics � antibiotics kill bacteria, but won�t do a thing against cold and flu viruses. They will, however, kill off some of the friendly bacteria which is part of your immune system, leaving you less able to fight off the virus. Therefore your cold or flu may last longer than it otherwise would have.